Assessment forms the backbone to the Ark GFS school year, with all students experiencing 3 full assessment cycles, one at the end of each term. Each term, the exam timetable is sent home to parents. This is sent along with some guidance on how parents can support from home. The exam timetable sees all students gain the experience of taking assessments in full exam conditions in the hall. This is one of the things that make Ark Greenwich Free School unique, as this is not a common experience in all schools. This is key to ensuring that students can get used to the pressure of the exam hall, well before their GCSEs, so that when the time comes, they are well versed in the expectations. High quality assessments are linked directly to the curriculum being taught. Good assessments provide students with the opportunity to use the knowledge/ content/ skills that they have been taught, in a way that is authentic to the subject discipline. Bambrick-Santoyo puts it clearly when he says with good assessment it is not ‘teaching to the test, but is testing the teaching’ (Bambrick-Santoyo, 2012). AGFS considers that all assessment can be formative until the public examinations in year 11. This is because there is an emphasis on the feedback following each one. Assessments can exist in the form of exit tickets, questioning in lesson, using mini whiteboards, mini topic quizzes, to name a few. The information collected should be used to inform the next steps for the teacher and/or students. For more detail on how this feedback is given, please refer to the AGFS Feedback Standards. Sufficient assessed tasks are provided for students to capture sufficient study time – At AGFS we use a variety of low and high stakes assessment, and ensure that students understand how these are used differently. The tasks are engaged with by students, orienting them to allocate appropriate amounts of time and effort to the most important aspects of the course – AGFS provides a clear revision, exam, review cycle to all stakeholders. The feedback focuses on students’ performance, on their learning and on actions under the students’ control, rather than on the students themselves and on their characteristics – reference to the assessment outcomes is coupled with the narrative that students develop a growth mindset and focus on next steps of learning. In KS3 students will receive coded key constructs on their academic report card, which identify the key areas in which further learning is still required (maximum of 4). In KS4, as the students are studying towards exam specification criteria, question/skill level analysis is completed by the teacher, and a personalised learning checklist is provided to each student, in every subject they study. This provides a RAG rating against each topic/skill tested and can be used as a targeted revision checklist, to prepare for the following internal/external examination. Feedback is appropriate, in relation to students’ understanding of what they are supposed to be doing – students are regularly shown model high grade answers, so that they are clear on the desired outcomes, and how to achieve these. Feedback is received and attended to – The assessments form part of the teachers ‘deep marking’ load, and ensure that the feedback given to students timely, and allow for them to review their own work, and the work of their peers, effectively. Teaching of the content required for the term, is planned and delivered, in line with the 5 year map and subsequent medium term plan. The review period allows the students to review their assessment outcomes and, supported by the teacher, complete a review/re-drafting of their assessment/work. 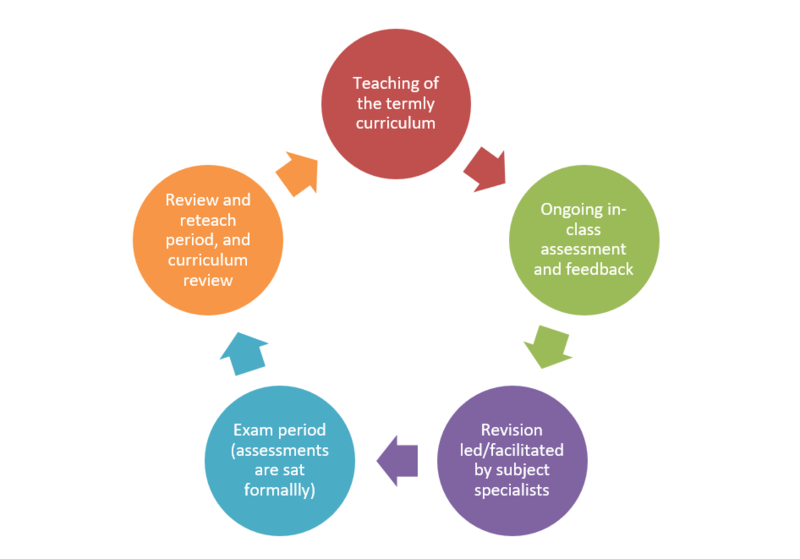 Teachers complete a question/skill level analysis and a personalised learning checklist for the subject is sent home with the reports, which provide information on detailed performance to stakeholders, and is also used to review the curriculum for subsequent teaching. All assessments are quality assured by SLT, to ensure they are robust, age-appropriate and fit for purpose. This is recorded, alongside other departmental records, in the subject benchmark portfolio.